In 1861 the Review & Herald published letters from Ireland reporting that five persons had begun keeping the seventh-day Sabbath as a result of receiving books and papers from relatives in the U.S.A. The Seventh-day Adventist Irish Mission was organized in 1902 and includes the Republic of Ireland and Northern Ireland. The Irish Mission has 10 churches and 783 members. In the country of Ireland [point out on map], God is using a special little group of missionaries to share His love. These are God’s little missionaries that we will learn about today: Ann, age five; Franchesca, six; EJ, Jayron, and Kymi, seven; Molly, eleven; and Kayziah and Kezkzaiah, both fourteen. Every week, these Adventist children meet with Ms. Batoon, their choir director, to practice singing together. Because they don’t have a regular church building where they can practice, they meet in each other’s homes. Then on Sabbath, they often sing during the church service at the school. But they do much more than just sing at church. They sing in many other places, such as in hospitals, and in nursing homes where they sing to the elderly people. Even though in Ireland, people don’t really like to talk about religion, they welcome the children for singing. And the children are happy to share their simple little songs about God. Some of their favorites are “Seek Ye First,” “Jesus Loves Me,” “Take My Life and Let It Be,” “Jesus is Beautiful,” “Stand Up, Stand Up for Jesus,” and “I’m a Child of the King.” In between the songs, the children like to share some of their favorite memory verses. Many times when the children sing, the people listening to them will cry because they are so happy to hear them. 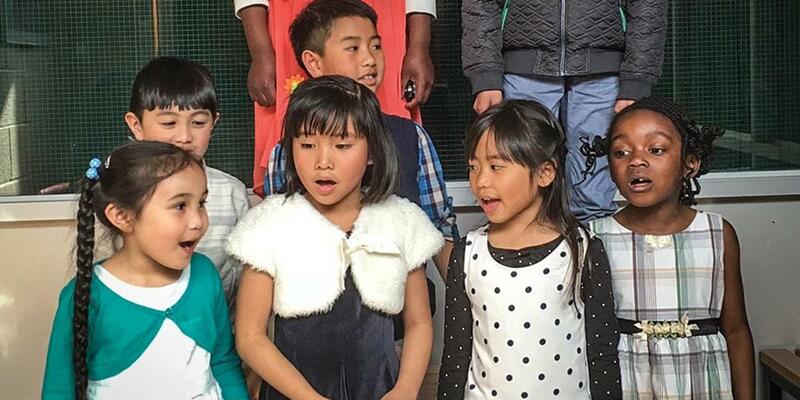 So far, this little children’s choir has sung in twenty nursing homes all around the city of Dublin—and they keep receiving more invitations to come back and sing again! In December, the little children’s choir receives many more invitations from hospitals to come and sing Christmas songs such as “O Holy Night,” and “Silent Night” for the patients and staff. The people love to hear the children sing and want them to sing their songs again and again. “Even though they are small, they can do big things for Jesus!” says Ms. Batoon. Besides singing in hospitals and nursing homes, the children also gave a special concert to help raise money to build a church of their own. For now, they are meeting in a school each Sabbath, but one day soon, they hope to have their very own church. You can help them build a new church in Dublin, Ireland, by bringing your Thirteenth Sabbath Offering this quarter. Thank you for helping the children in Ireland!